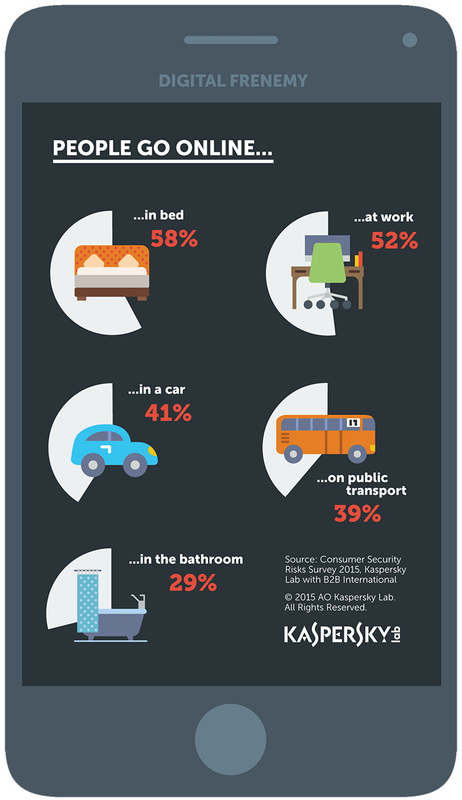 Research by Kaspersky Lab and B2B International shows that the relationship between users and their digital devices is often closer than between best friends, with 29% taking them into the bathroom and 25% sharing secrets with their device that they don’t want anyone else to know. However, this trust could be leaving users at risk as devices can be hacked and private information exposed to the world. The study found that the overwhelming majority of people (87%) store important, confidential and sometimes irreplaceable information on their smartphones, including passwords, messages, photos, contacts, files and more. One in four says their device carries sensitive information they wouldn’t want anyone else to see. Further, these devices are carried and used everywhere, including at work (52%), in a car (41%), on public transport (39%), in bed (58%) and even in the bathroom (29%). Outside the home, these devices face potential risks that include damage, loss and theft, but also hacking by cyber-criminals intent on stealing data or even spying on the user. Devices that are used on open Wi-Fi networks are particularly vulnerable to attack. However, few people take action to reduce their risk. Our study found that just 26% of users adapt their online activity when on an insecure public Wi-Fi network, despite the fact that hackers can easily intercept data and passwords. Only around half (47 %) takes advantage of the security features that come with the device, such as remote blocks or find-my-device capability. The impact of not protecting the devices we carry with us can be far-reaching. According to the study, a quarter of those whose device had been lost or stolen discovered that personal or secret information had been leaked. But it doesn’t follow that users are automatically more secure once at home. Here, they face different and sometimes greater risks, particularly in sensitive places such as bedrooms and bathrooms, when a hacked device could easily turn the webcam on the user. “The bond of trust between users and their devices can lead them to forget about security. It’s hard to imagine that something we carry close to us at all times and turn to for everything, could ever become a threat. But it can, and does happen. A digital friend can become a digital frenemy,” said Victor Yablokov, Head of Mobile Product Line at Kaspersky Lab. “A failure to appreciate the potential risks and to protect our devices and information accordingly could mean the loss of confidential information, money and even our identities. The device camera that we use to look out onto the world can be hacked and used to look into our world instead. Security is simply not an optional extra,” he warned. To ensure a digital friend doesn’t transform into a digital frenemy, Kaspersky Lab recommends that people always set strong passwords for devices and for their online accounts, install a trusted security software and take care when accessing websites and downloading apps, particularly over insecure Wi-Fi networks. To check if your online behavior is safe, follow https://blog.kaspersky.com/cyber-savvy-quiz. To get more tips on how to be protected, check https://blog.kaspersky.com/tag/cybersavvy.